"I'm going to read just one chapter before I go to bed." This is the biggest lie a reader can tell themselves. Especially if it is a new book. Even more so if it is the kind of book that pulls you in emotionally by the second page, and doesn't want to let go. I know this, but I didn't think about it when I decided to start Eleanor & Park around 1 o'clock in the morning. "Just one chapter. Maybe two," I promised myself, "I just want to see if I'm going to love it, and then I'll go to sleep." Hours later, I was still reading. Thomas stirred beside me, and rolled over, one eye opening cautiously against the light. "What time is it?" "It is around 2 o'clock-ish," I replied quietly, hoping he would roll back over and fall asleep. But it wasn't to be. As he reached for the tv remote, I knew it was all over. He was going to discover what time it was...and so was I.
I'm not saying I lied to him. I didn't know what time it was exactly, and I didn't really want to know (as I needed to be up at 5am), so I reached for a time that didn't sound too awful. 2 o'clock. And I added an "around" and an "-ish" to amp up the vagueness. It wasn't my fault that Eleanor & Park had torn my heart into tiny pieces, and I couldn't put the book down until I knew for sure it was going to stitch them back together again. "It is 4:15!" Thomas exclaimed, "Four fifteen. Why am I awake right now?" "I don't know. You should really go back to sleep." "Why are you awake right now?" "You are reading a book." "Yep. 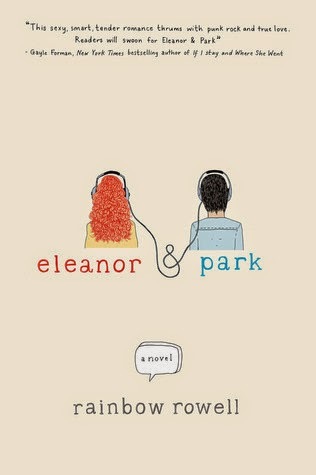 Eleanor & Park." and then I said, all in one breath, "The author's name is Rainbow Rowell, which is the best YA author name ever. It is all about this girl named Eleanor who has a really messed up family life, and she meets a boy named Park. But it's better than that. The narration is split between the two main characters, and it is set in the 80's. Every single teenage feeling happens. It has music and comic books, but not in a stupid way. Their relationship is so sweet, and real, and in the moment. And Park's mom is an issue, but then she isn't, and you have to love her. And Eleanor and Park work so hard to learn how to communicate. You just want to cheer for them. And then this thing happens that is horrible. But the response to it is so perfect. Then it is heartbreaking again. But I have five pages left, and I'm hoping for something amazing." Thomas stared at me with half-opened eyes, "Okay. I didn't get most of that, but it all sounds really emotional and angsty. I'm going back to sleep now." I needed to be up in less than an hour, so I finished the last five pages of Eleanor & Park, blew my nose (because, yes, there was something amazing, at the end, and then there were tears), and started my day. Some books are worth staying up all night to finish. And just so you know, Rowell did stitch my heart back together at the end. Have you read Eleanor & Park, or any other Rainbow Rowell books? I love that book! Like LOVE it! I read it all in one sitting, as well, though I think mine was in the afternoon...(so not judging, I swear!) And yes, there were tears. And I wanted to rage at people, and my heart was in million tiny pieces. And that's all I can say here without spoiling the book for anyone who hasn't read it yet. <3 Love you lady! What was the something amazing at the end?? I remember being sad. I'm also laughing about 4:15. I have a tendency to fall asleep reading and then sneaking into bed way later than I should. Cassidy goes to bed pretty early and he's a light sleeper so I just pray I can slip into the covers and he won't notice. When he does, he inevitably has to pee. And when he has to pee, he inevitably has to look at the clock. And when he has to look at the clock, he inevitably has to scold me in his head. Not out loud. He'd never do that..
OMG! That's MY life you're describing and my hubby, too! It's a good thing more men don't read. Families need at least one functional parent most days!